If you’re old school, Twitterrific for Mac was probably your first Twitter client. Twitterrific for the Mac came out in January 2007. I joined Twitter in March. It was the first native Twitter app for the Mac, and I loved its small footprint, dark UI, and color-coded @replies. For a long time Twitterrific was Twitter for me. It’s funny to look back at how I used Twitter over half a decade ago. I followed dozens of people and would often post Tweets through a Quicksilver plugin, treating my tweets as one-line “status updates” which lived on my site’s sidebar. Visitors to my blog circa 2006 and 2007 could see a “this is what the author is currently doing” message. Obviously our usage of Twitter has changed drastically since then. Twitterrific for Mac shipped the same week Steve Jobs announced the original iPhone. Now, almost 6 years later, I primarily check and post to Twitter via my iPhone. 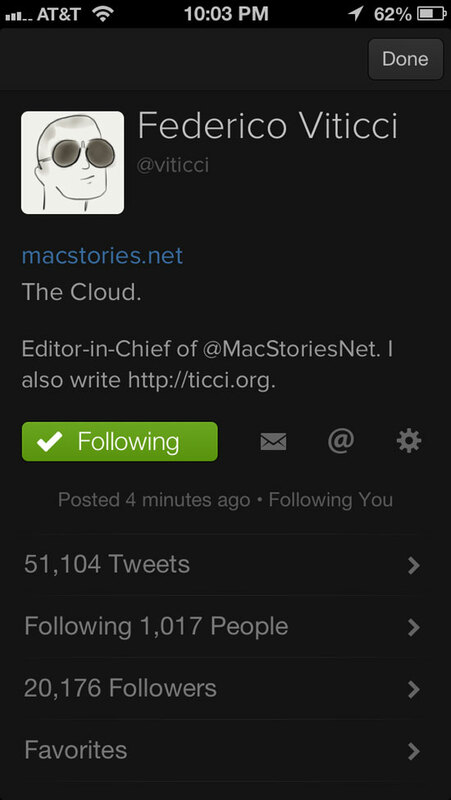 Six months after Twitterrific for the Mac shipped, the first proof of concept for “MobileTwitterrific” was announced in August of 2007. Twitterrific for iPhone launched on July 11, 2008, and was one of the first apps in the brand new App Store for iPhone. Before Twitterrific for iPhone, we were all using web-based Twitter apps. Remember Hahlo? Today, Twitterrific is 5 years older and 5 versions mature. The app has gone through many design iterations over the years, but has always remained true to its roots. Additionally, Twitterrific has made many significant contributions to the Twitter ecosystem at large — it was the first native Twitter client on both Mac and on the iPhone, it was the first to coin the word “tweet”, and it was the first to implement a bird icon. Graphics-wise, the newest version of Twitterrific is simply stunning. Without any hyperbole, I consider T5 to be the best-looking version of Twitterrific to date and one of the most attractive iPhone apps I’ve seen in a long time. Thanks in no small part to the great use of typography and color. Though this new version seems to me the furthest departure from the original design, it still has hints of familiarity and does not cast aside all design elements from past versions. 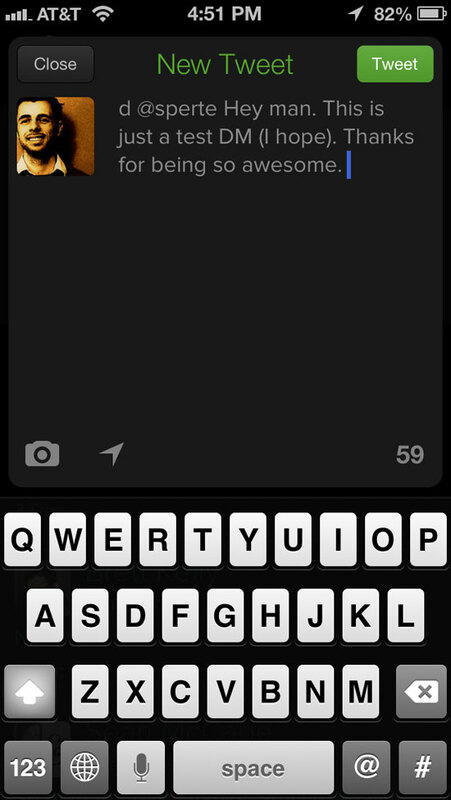 I haven’t used Twitterrific on my iPhone since 2008, which is when I switched to Tweetie. Then it was Tweetie 2, and then Tweetbot. All these aforementioned Twitter apps are not just great apps for Twitter, but they are (or were) great iPhone apps, period. The look and feel of Twitterrific 5 is, in my opinion, its greatest selling point — it has a UI design on the same caliber as what I consider to be some of the best iPhone apps ever built. Twitterrific 5 strikes me as an exercise in simplicity with a focus on all the little details. When your UI doesn’t use gradients or drop shadows or boxes to hold itself together, all the loose elements have nowhere to hide. Any designer worth their salt will tell you that a “minimalistic” app like this is extremely difficult to pull off well. I say the Iconfactory hit a home run. Twitterrific’s most historic design detail is its liberal but clever use of color. Twitterrific has always used colors to signify the various types of tweets, and it’s no different in version 5: – @replies directed to you use a yellow, orange, and red color scheme. – Tweets which simply mention your @username use a brown and tan color scheme. – Incoming direct messages are dark blue. – Outgoing direct messages are teal, with an arrow pointing to the name of the user you sent the message to. – A purple line underneath a Tweet signifies where the current tweet marker is (you can sync your timeline position via iCloud or the TweetMarker service). Another historic design element is Twitterrific’s customizable themes. Just like in past versions of Twitterrific, T5 lets you choose between light or dark themes, adjust the font size to anything from teeny-tiny to ginormous, and more. What’s new, however, is you now get a choice of the typeface itself. Custom fonts include Helvetica (of course), Proxima Nova, Museo Slab, Calluna, and Signika. Naturally I’m using Proxima Nova — it’s a gorgeous typeface which I think looks especially stunning on a Retina screen. Also new: T5 can switch between light and dark themes automatically based on the time of day. Bright theme in the daytime, dark theme in the nighttime (a la Instapaper). This option is clever and fun; I had it turned on for a few days, but ended up turning it off because I like the dark theme too much. Interestingly, popover notifications and slide-up selection buttons are not customized. So much of Twitterrific’s design is unique and customized, I was a bit surprised to see these default iPhone elements. 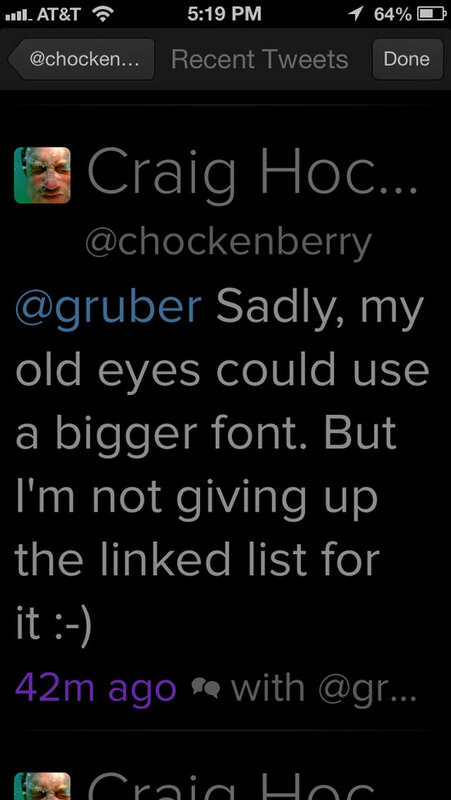 Showing DMs right within the main timeline, as Twitterrific always has, always freaks me out. After a few days I’ve slowly acclimated to seeing a blue message and knowing blue means not publicly viewable. There is, of course, a Messages tab, however, you cannot start a new DM thread from within it. You can view and reply to any current DM conversation you’re having with someone, but you cannot begin a new one with a new person. The only way to start a new DM thread is to first navigate to a user’s profile, and if they follow you then you’ll see a small envelope icon. Tap that to start a new DM conversation with that person. No mobilizer view available in the in-app Safari web view. No muting of keywords, tags, clients, users, etc. The core function is not managing your Twitter account. Nor is it being a general purpose tool to exercise every nook and cranny of the API. It’s primary function is not to act as a surrogate for SMS messaging. I asked the awesome gents at Iconfactory why they chose to not ship T5 with push notifications. It was a two-fold answer from both Craig Hockenberry and Gedeon Maheux. I am an advocate of Craig’s stance on disabling as many notifications as are reasonable. But for me, there are many peers and comrades that I connect with throughout my workday, and Twitter DM is one of the primary ways we go about doing that. Fortunately, push notifications are in Twitterrific 5’s roadmap, they’re just not here yet. For the past week, I’ve been bouncing between both apps — using Tweetbot for DMs and Twitterrific for the rest. I know it’s silly to use more than one Twitter app, but the look and feel of T5 is so splendid that I’m happy to be silly for the time being. Not to mention, if you have any appreciation at all for world-class app design,2 then Twitterrific 5 is worth checking out for that reason alone. It’s a universal app and is currently $2.99 in the App Store. ← The iPhone As Camera… Where To Now?